Golaem is the recipient of a 2018 Technology and Engineering Emmy® Award for its significant impact on television industry. Following the demand for more and more spectacular effects on TV driven by shows like Game of Thrones or The Walking Dead, without benefiting from the same budget or production time, television creators were in need for more effective crowd simulation tools. 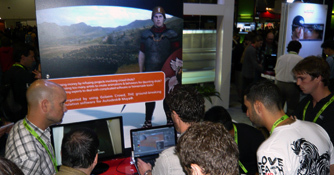 For years, Crowd Simulation was reserved to projects with large budgets and extensive deadlines. With the rise of TV production quality came a need to populate backgrounds and create epic battles on TV, on lower budgets and deadlines, without specialized artists. Golaem has been developed with these needs in mind and introduced several workflows and features, like its unique Layout Tool, making it the first off-the-shelf cost-effective crowd simulation tool accessible to studios of all sizes. Golaem Crowd simulation tools integrated in their daily software, usable without any programming knowledge and including post-simulation edit tools have enabled creators to include spectacular scenes that they could not afford before. Nicolas Chaverou, Golaem Product Manager adds “This is a wonderful recognition of the impact Golaem has in TV production, and we are already working on going further and supporting the latest trends in the industry, with the upcoming Golaem 7, to be released in a few weeks”. The Golaem Team received the award at the 70th Annual Technology & Engineering Emmy® Awards on Sunday, April 7, 2019 in Las Vegas hosted by the National Academy of Television Arts and Sciences during NAB. Golaem develops artist-friendly tools to animate digital characters. Integrated in Autodesk Maya, Golaem make it fast and affordable to populate worlds with directable digital characters, from a few to thousands. Artists from all over the globe use Golaem tools to bring life to commercials, episodic productions, feature films and games. Here is our yearly selection of the best student projects using Golaem! By the way, did you know that Golaem is free for universities & students? You can grab a free & unlimited Personal Learning Edition (PLE) package here. First let's start with a flashback from last year. Hybrids was nominated and won an incredible amount of awards in festivals, the latest being Best in Show Award SIGGRAPH Computer Animation Festival, which makes them automatically included in the long list for the Oscar for Best Animated Short Film. When marine wildlife has to adapt to the pollution surrounding it, the rules of survival change... Yohan did a great jobs animating hundreds of cap-topped crabs climbing on a fish with Golaem. 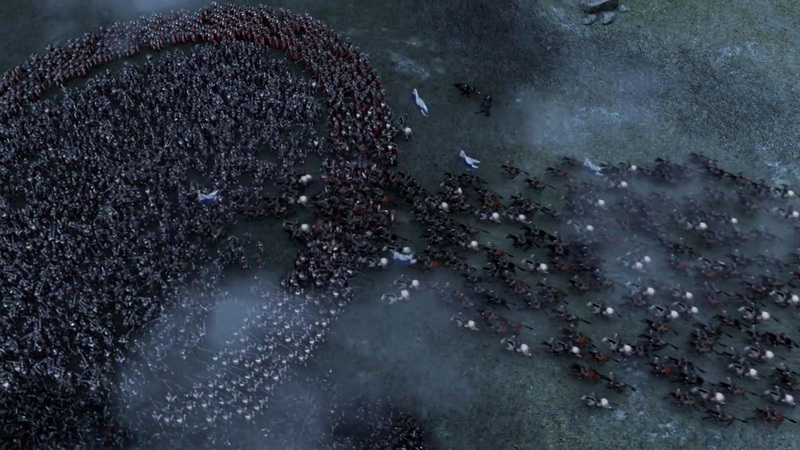 Jose made a remake of this iconic battle from Game Of Thrones season 7. We were amazed that he was able to recreate a shot like this all by himself! Pere made a remake of the Bridge Attack in Thor Ragnarok. It does not feature so many characters, but it involves close interaction to create the pile of characters. Marcell and David were inspired by the Lego Zombie Horde by Nixolas and decided to create their own Lego movie with Golaem. After a few days of Golaem training at ISART, François and Félicien created a short movie including zombies and explosions with a nicely integrated soundtrack. François is currently working as a Golaem artist for Solidanim. Here is the ultimate video series for creating stadium shots with Golaem! It shows the most up-to-date & convenient way of creating stadiums with Golaem, including the latest novelties like our new reference workflow. 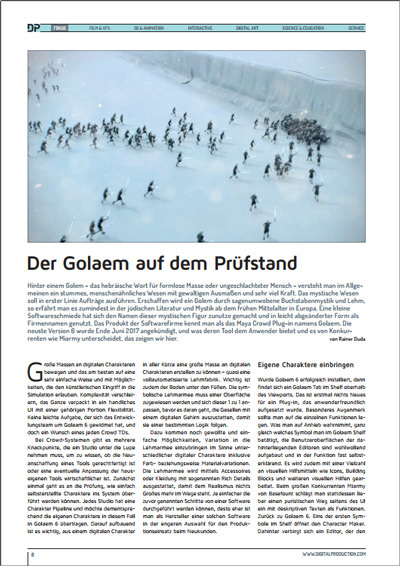 Our friends from Digital Production (https://www.digitalproduction.com/) recently published an issue including a comprehensive overview of available Crowd Simulation software, and obviously Golaem was in the selection! Actually, the Golaem part even include 2 articles, as on top of a test by Digital Production the issue includes an interview with Nixolas (http://www.nixolas.com), the well known magician who created the hilarious Pokemon, Star Wars, Lego... videos using Golaem. "I remember having to quote on a job that required a stadium shot, and after installing Golaem and using their extremely helpful resource of tutorials and knowledge-base, I was able to put together a test that I could ship to the client in under a couple of hours. The rest of the work really involved custom models, rendering, and scene setups depending on the shot at hand. I was able to jump from a couple of weeks of work and in-house development to around a day or two, depending on the assets needed. Since Golaem comes with an amazing character pack – 9 times out of 10 you have everything you need to get started on a basic industry standard job." 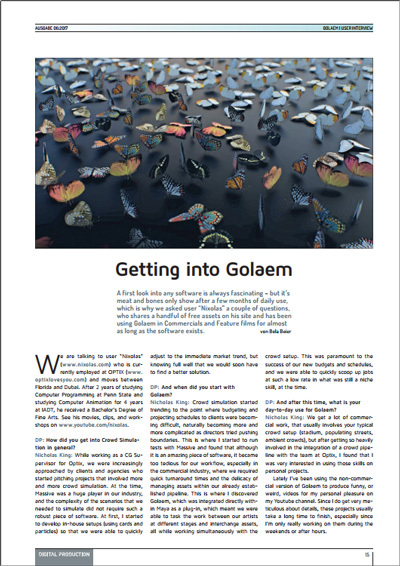 "One amazing feature that was introduced recently was Golaem’s Simulation Cache Library. With this feature, you’re able to create simulated crowd assets that are organized for you in this little window. Say you have to populate a city street and you have access to animations of people walking, leaning against the walls, smoking a cigarette, having conversations with each other, selling something on the street. [...] With Golaem’s Simulation Cache Library, I could create asset scenes where each scene would hold one behavior needed, like people walking down the sidewalk in a straight line, passing each other, another would be a few variations of people conversing with each other, etc. You can bake these out and add them to your Simulation Cache Library. Now I can go to the 5 or 10 shots needed to populate the streets, and literally drag and drop each of these behaviors. 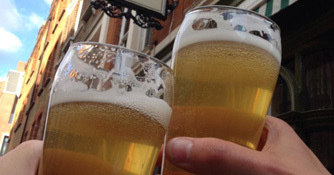 It will create a crowd proxy and you’re ready to go. Coupled with the Cache Layout Tool that I mentioned earlier, you can create a completely complicated crowd scene in minutes once your library is set up."